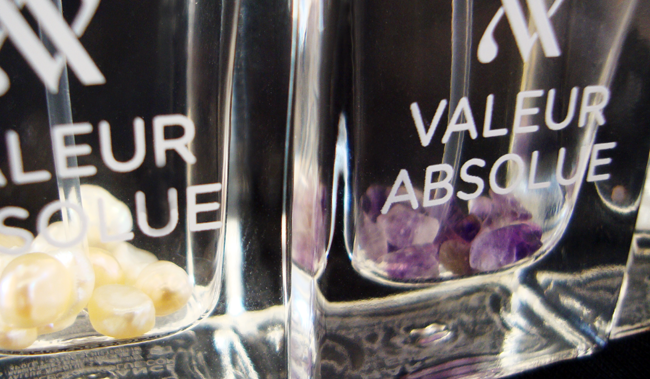 Valeur Absolue: Mood-Related fragrances with the benefit of natural ingredients. All of the fragrances contain something precious in their bottle. This is "Sensualité" with mother-of-pearl. On the right you see "Harmonie" with amethyst. All on the left is "Joie-Eclat" with mother-of-pearl. 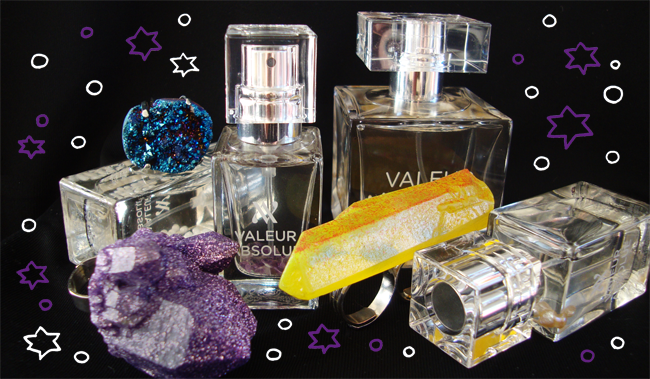 Let me tell you about Valeur Absolue, a new Swiss perfume brand that claims to bring you more than just perfumes. "Valeur Absolue is a name that implies something that is absolutely essential and ultimately worthy"says Bénédicte Foucart, president and CEO of the company about their products. 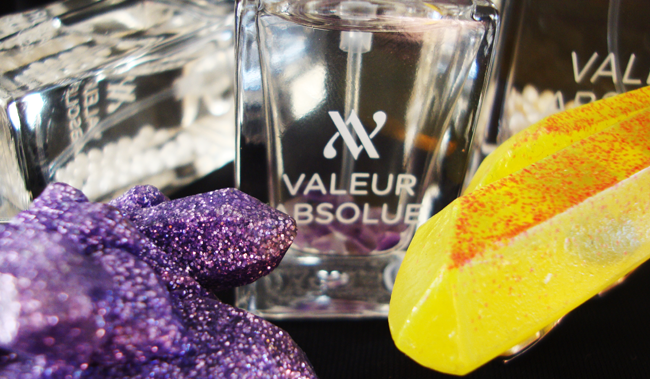 Valeur Absolue are three perfumes made from the best natural integrants and all of them mood-related. They all contain Areaumat Perpetua, a natural extract which stimulates the so called "well-being" molecules. This scent is like a calming tea ritual and based around musk. Neroli bigarade and Earl Gray form a harmony with woody notes and vanilla. High quality essential oils of bergamot and orange flower are added for a relaxing effect, while potassium and manganese provide energizing qualities. The amethyst stones in the bottle are encompassed within the bottle as a visible symbol for harmony. A perfume that reflects the curves of a woman. Floral, woody and musky notes create this super-feminine fragrance. Rose de Mai, white jasmine, exotic white flowers and soft tones of cedar wood are combined with mysterious amber and musk. 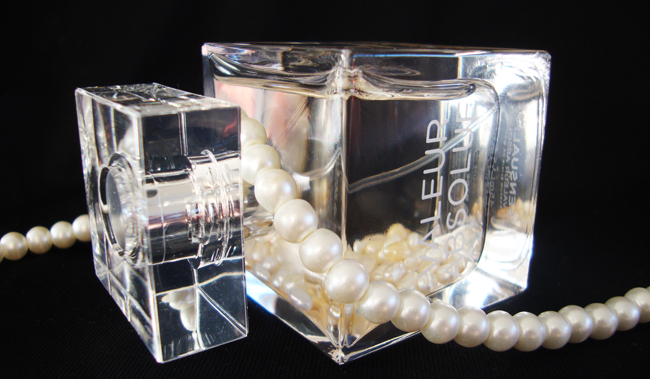 Mother-of-pearl in the bottle symbolizes love and feminity. Sparkling like a glass of champagne, the fizzy Joie-Eclat contains fresh tangerine and green cardamon as well as fine vetiver, tuberose, grapefruit and vetiver. From all the three, this is the fragrance that stays on the skin for the longest. with it's fresh and elegant note. The first time ever, diamond powder has been used in a perfume, as a visible sign of sparkle. After testing all the three fragrances, I must say that wearing all of them feels very good. Fitting to the fact that I am a curvy girl, Sensualité is my favourite. I love floral feminine perfumes, especially if they contain jasmine. I think it's the most dominant of the three fragrances and it lingers pretty long on my skin. Especially Harmonie is a little bit too soothing for my taste, but I am sure many girls will love it as a beautiful everyday fragrance. I don't believe in aroma therapy, so I can't say that the special additions to the perfume actually have an effect on me, but nonetheless all of the three perfumes seem precious to me. I love that they added amethyst, mother-of-pearl and diamond powder to the bottles, it makes them very unique and a pretty addition to every perfume collection. Do you believe that a scent can influence the well-being of the mind and which one of the three Valeur Absolue scents would you pick? Instead a lot of pink roses and cherry blossoms. No true vintage look without fascinator, do you agree? Petticoats are made for dancing! 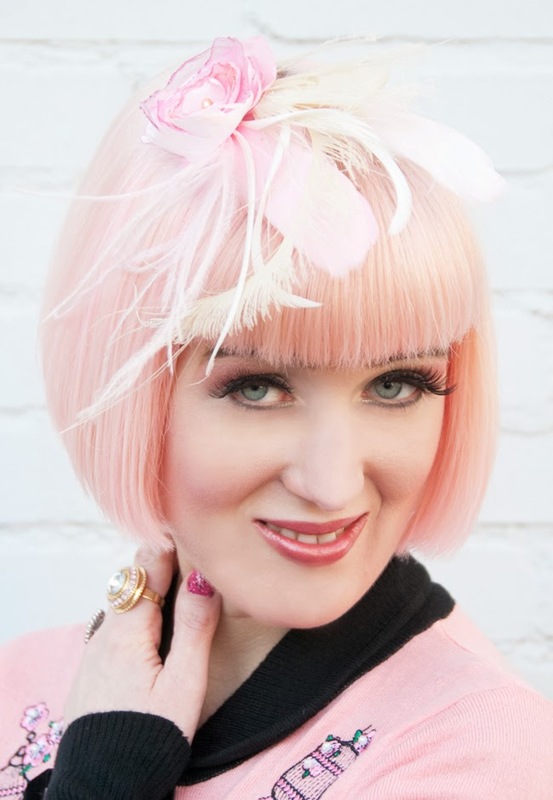 So proud that I managed to match the shade of pink from my top, hair and fascinator this well. Japanese cherry blossoms and pretty cages: Isn't this romantic? Wearing glitter boots, that's how I roll. Birds in cages dream of flying high, high on the sky. Freedom is a precious thing for those who lack it. Seeing animals imprisoned in zoos always causes a little bit of sadness in me, despite the joy of being able to see tigers, lions and elephants, without traveling to places far away and going to a safari. Therefore I am happy, that they are pretty bird cages on my top, but just beautiful cherry blossoms instead of imprisoned animals. The sweet illustration on my top makes me think of an Asian fairy tale, just like Disney's Mulan. I'll never stop being a Disney girl for sure. I am back to pink hair as you can see. Feeling like a bird myself again, Sara the flamingo. And lucky me is a free bird as well. Free to wear whatever I want, free to have fun and enjoy myself. This is one of my genuine vintage looks again. I know a few of you would love more of my fifties looks. I wasn't very much into the mood for this kind of style lately, but a visit to Collectif Clothing changed everything instantly. I couldn't leave without this skirt and top. Especially the velvet skirt caught my eyes immediately. 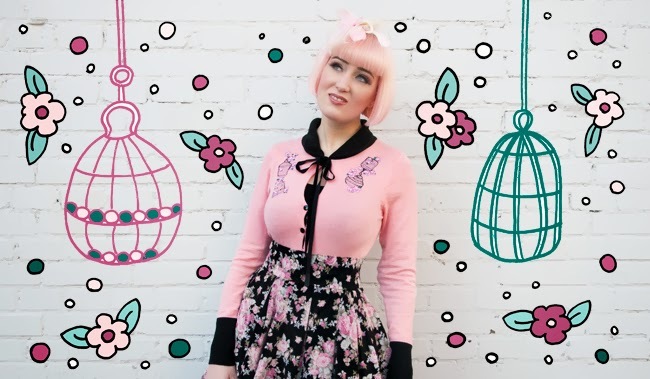 It's amazing: Like no other shop, Collectif seems to have discovered the secret of how to make girls feels like ladies, just with a piece of clothing. 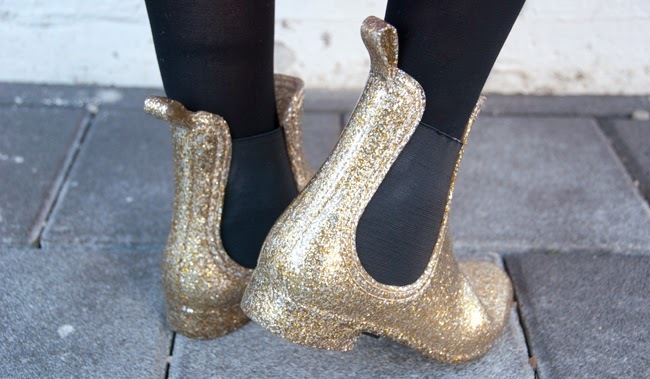 Add a little bit of glitter – just like I do with my shoes – and every gray day will have a happy end. How do you like this pink look my lovelies? 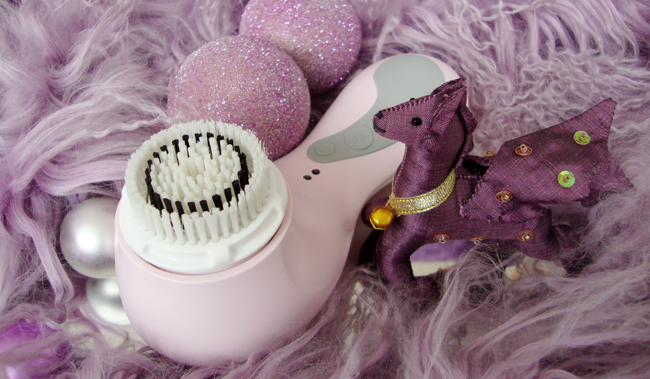 The new Clarisonic Plus Brush. Everybody talks about it at the moment. A miracle for skin care? I am testing it for you! Are you happy with your skin or do you think it could be better like most girls? A more even skin tone, less pimples, diminished redness, less visible pores and much more is on the nearly endless wish list for a better skin. 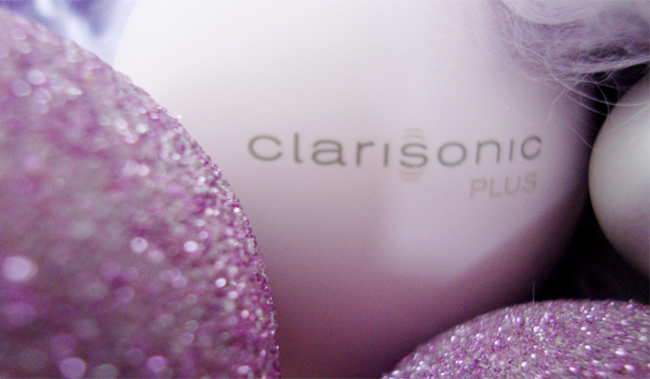 At the moment there is a lot of talk about the Clarisonic Plus everywhere. Magazines and blogs write euphoric articles about this so-called new holy grail of skin care, but you also find reviews with less positive feedback. The promises are big: Clarisonic Plus, with its brush that produces over 300 movements per second, is said to make your skin smoother, softer and healthier looking and all this six times better than any form of manual cleansing could achieve. 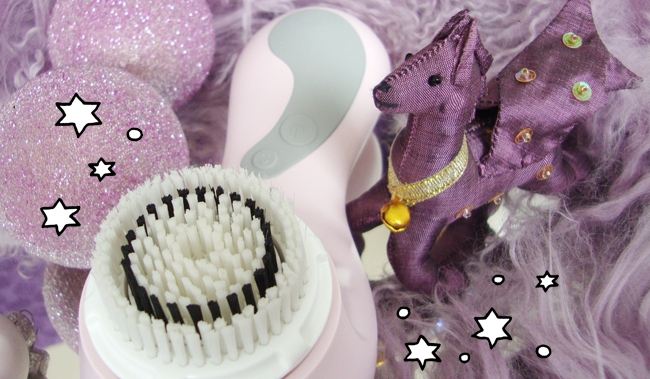 I am very happy I could test the new Clarisonic Plus, thanks to Coolbrandz and I hope my feedback is helpful for you. Since I got this brush, I talked about my experience with all my girlfriends. Surprisingly, two girls I always adored for their perfect skin revealed that they are into brushing as well. I don't think this is a coincidence! I started to use the face brush. Right after the first use, my skin feels like it never felt before: Absolutely clean, smooth and healthy. I am amazed. I used the Clarisonic Plus twice a day for a week now. Especially my cheeks look less dull and almost flawless. I think my pores are really refined, especially on my nose. I can't see a difference to the fine lines I have on my skin, but my skin is definitely less oily than it used to be. I expect the long term use will bring even better effects. I used the body brush only twice yet. It has a similar good effect, but the use is a little bit time consuming, so I think I'll mainly stick to use my brush for the face. - The improvement of the skin is amazing. I never had skin so smooth and my pores are less visible. - It's very easy to use and no effort at all. Cleansing the face takes 60 seconds. - It's waterproof, so you can use it in the shower. - There is a body brush included. - The device itself is a little bit heavy and bulky, which is especially an issue if you travel a lot and want to take it with you. - The charging time is pretty long. 24 hours of charging mean about 30 minutes of use, this is not that much, especially if you use the included body brush. Every year it's a guessing game: Which colour will be chosen as colour of the year by Pantone? In 2013 Emerald had it's big appearance and now the secret is revealed, that 2014 will be the year of Radiant Orchid. Radiant Orchid is a mixture of purple, fuchsia and pink. According to Pantone it's "an invitation to innovation and encourages expanded creativity and originality". Further they say that the rosy undertone of the colour produces a healthy glow when it is worn. Despite the promising statements from Pantone, The Guardian doesn't approve with Radiant Orchid as a good choice at all. They say it's 30 years too late and describe the shade as middle-aged, just fit for people who are into Prince's shirts or Cyndi Lauper's lipstick. I collected a few fashion items here, which are in Radiant Orchid or come pretty close to it. Confession: I don't care about The Guardian's opinion. 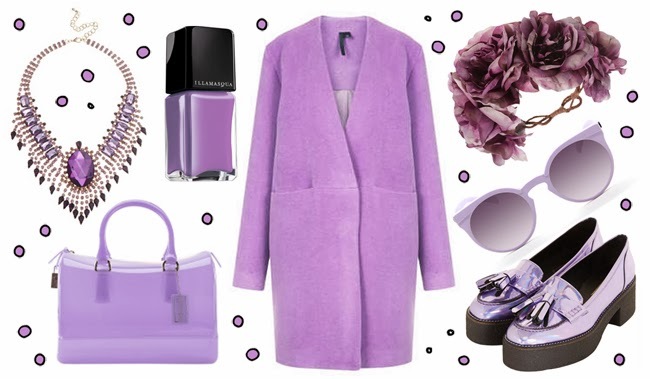 Right now I imagine myself wearing that radiant (orchid) coat together with the holographic shoes and the Furla bag, walking through a snowy landscape and singing "Purple Rain". And yes: Why not with a purple lipstick, just like Cyndi? Long live the 80s! Are you with me or without me when it comes to Radiant Orchid? It's pink, it's fluffy, it must be mine! This look is a wild mixture of high street fashion, vintage and desiger pieces. 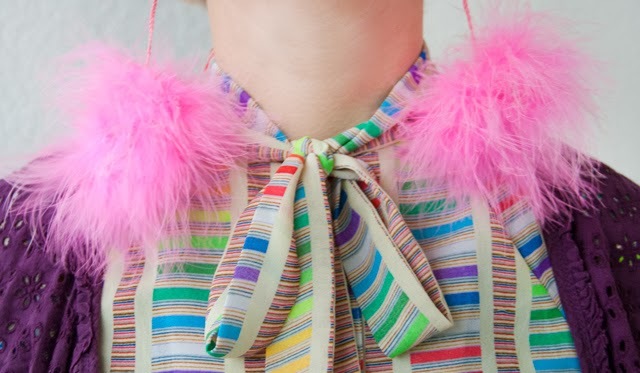 Marabou feathers and bows, what else? A rainbow look a day, keeps the bad mood away! Playing with colours and mix them like a Tasmanian Devil. Yeah! A bold statement for a bold look: Bam Bam, here I am! Bam Bam! Another day on my mission to colour the world. I am the Tasmanian Devil of colours and I mix together in a wild frenzy what crosses my way. 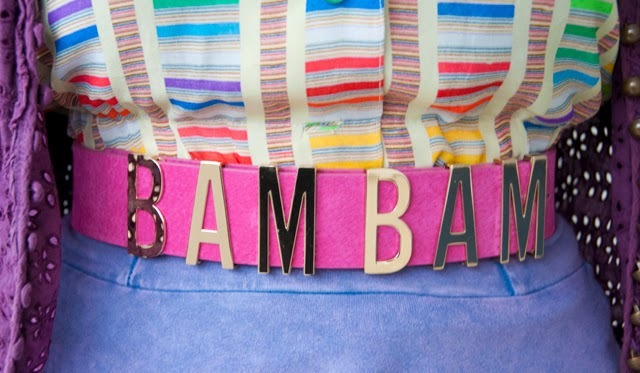 Bam Bam says my belt and that's exactly how I feel. My pom pom addiction has come back as well. Do you understand why when you see this pink marabou feather earrings? 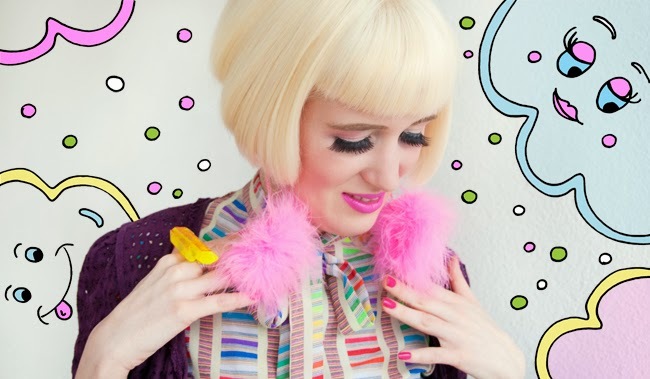 When I spotted my new rainbow crop top in a vintage shop in Zurich, I had to think of my friend Jessica from Dazzle & Jolt instantly. She is a big inspiration to me, because she is the most colourful person I ever met. Just thinking about her helps me to never get gray and boring. I think the pattern of the top is rather unusual for vintage clothes. I wonder who owned it before and imagine that she bedazzled her boyfriend or had fun at the beach while wearing it. I am hiding a Heattech top and a second pair of tights beneath my outfit, to make it fit for this cold day. Even if I love scarves and fluffy jumpers, I refuse to wear them every day. Heattech is the solution how to wear less thick things without freeze to death. People always wonder how I manage to go out with just a thin top, now you know my secret. I hope I brightened up your gray winter day a little and I am curious to hear how you like this look. Festive season is coming closer in a fast pace and with it the invitations to dinners and parties. Wearing a dress is always a good choice either to please future mothers-in-law or to look splendid at your office party. This season is the perfect excuse to wear glitter, romantic clothes, a little bit kitschy accessories, lace and sequins. I think choosing a dress is far easier than buying other garments: Dresses are flattering no matter if you are small or tall and there is a dress for every size and body shape. If I had to decide for my favourites I would love to wear the Bernie Dexter dress with it's romantic Christmas village print to the family party and the bronze metallic dress from Topshop for New Years Eve. 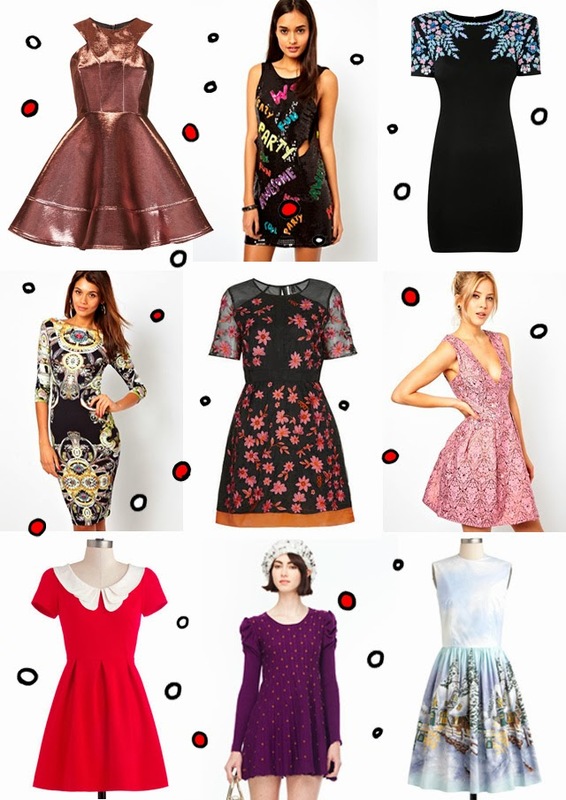 Do you already have outfit plans for the festive seasons?